Pop star Katy Perry is known for her wild style but she has taken it one step further with her new music video E.T. The video is set for release on March 31st but Katy Perry has revealed her extra terrestrial new look with images on the Katy Perry Facebook page. As you can see she is wearing elaborate pink and white make up with purple lipstick, blue eyeliner and bright turquoise contact lenses. The whole song has an alien abduction theme and from the image, it looks like Katy will be transformed into an alien in the video. The make up is extreme but it is the Katy Perry E.T. contact lenses that really take this look to the next level. They make her look really strange and alien and the colour is just fantastic. In the other images on Katy Perry’s Facebook you can see that she has a bizarre plaited hairstyle with cornrow plaits that fan out like branches of coral or sea anemone. No one knows what her outfit will be like but hopefully it will be as wild and colourful as the make up – and Katy Perry rarely disappoints on the extreme fashion front. This entry was posted in Contact Lenses and tagged blue contact lenses, Cat Eye Contact Lenses, Cat Eyes Contact Lens, color contact lenses, Coloured Contact Lens, Coloured Contact Lenses, Contact Lens, contact lenses, Crazy Contact Lenses, Novelty Contact Lenses, Special FX Contact Lenses on March 28, 2011 by Piercing Guru. Until now UV contact lenses have only been available in plain colours but the new i-Glow range of lenses have a great choice of patterns in UV colours that really glow. 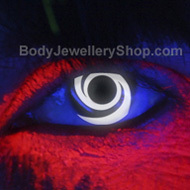 Body Jewellery Shop is the first online store to sell these lenses and I love the way the different designs look under UV light. i-Glow UV contact lenses are one of the few ranges of contact lenses manufactured in the UK and they are made under strict EU safeguards to ensure complete quality and safety. They are also 1 year contact lenses, so they are great value for money. 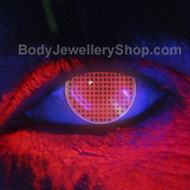 There are twenty-three different i-Glow contact lenses including popular crazy lens designs like cat eye contact lenses, checkerboard, biohazard symbols and even a Twilight themed contact lens. Below are three of my favourites but if you’re a fan of clubbing style I really recommend checking out the whole range. This entry was posted in Contact Lenses and tagged Coloured Contact Lenses, contact lenses, Costume Contact Lenses, Crazy Contact Lenses, Glow in the dark Contact Lenses, Glow In The Dark UV Contact Lenses, Novelty Contact Lenses, Party Contact Lenses, scary contact lenses, Special Effect Contact Lenses, Special FX Contact Lenses, UV Contact Lenses on March 10, 2011 by Piercing Guru. St Patrick’s Day is just around the corner and what better way is there to get in the mood than with a pair of green contact lenses? Everyone wears green and Irish flags but a pair of green contact lenses will definitely make you stand out, especially if you are attending a big event like a St Paddy’s Day parade or party. Here at BJS we have a great choice of green contacts including realistic colour contact lenses, novelty St Patrick’s Day designs and special effects like UV colour lenses. As with any contact lenses, it is important to store these lenses in a contact lens case and clean them with contact lens solution. You can wear them for up to eight hours, so if you are going to be out longer than that I recommend taking a case and solution with you. Then you can remove your lenses after 8 hours or if they become dry before then. This entry was posted in Contact Lenses and tagged Coloured Contact Lenses, contact lenses, Costume Contact Lenses, Crazy Contact Lenses, green contact lenses, Novelty Contact Lenses, Party Contact Lenses on March 4, 2011 by Piercing Guru. 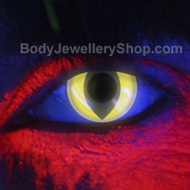 Calling all fans of gothic fashion, we have two brand new ranges of gothic contact lenses: Alchemy and UL13. Alchemy Gothic are famous for their gothic jewellery and now they have designed a great range of gothic contact lenses as well. Our new gothic lenses are all manufactured in the UK to ensure superior quality. They are yearly lenses, so you can wear them as many times as you like within one year of opening them. Personally I think we have a great choice of designs, from skulls and vampire lenses to retro designs and fantastic new colours. 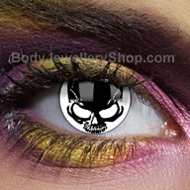 The main Alchemy range of contact lenses is dedicated to classic gothic motifs like skulls, crosses and dragons. It also features some surprisingly designs such as a beautiful raven contact lens inspired by Edgar Allan Poe’s Nevermore. All the designs would be perfect for Halloween but the three shown below are my picks for maximum impact with your Halloween costume. I particularly love the Vampire Moon lenses and the way the bloody surface of the moon stands out. 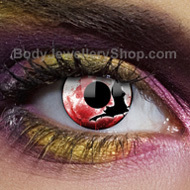 This entry was posted in Contact Lenses and tagged contact lenses, Crazy Contact Lenses, fashion contact lenses, gothic contact lenses, halloween contact lenses, Novelty Contact Lenses, Party Contact Lenses, scary contact lenses, wearing contact lenses on February 22, 2011 by Piercing Guru. 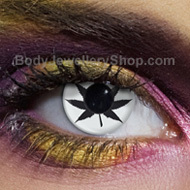 If you like to make a statement you’ll love our cannabis contact lenses! These awesome lenses feature hemp and cannabis leaves and they come in a choice of fantastic designs. There are so many different types of cannabis contact lenses but the ones blow are some of our most popular lenses here at Body Jewellery Shop. Naturally I would not recommend any illegal activities but these contact lenses are a great way to stand out from the crowd without breaking the law! The classic design for cannabis contact lenses is a large hemp leaf in the centre of the lens. In the lenses below, the leaf fits around your pupil and actually makes it look like your pupils have changed shape. This gives a really nice effect that looks really dramatic. 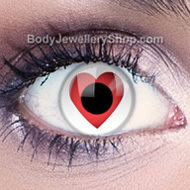 Changing the shape of your pupil completely alters the look of your eyes and these lenses are sure to get you noticed. The lenses below are from EDIT Contact Lenses, a great brand for high quality but good value contact lenses. They are Â£15.99 for a pair of lenses and I recommend them for occasions such as fancy dress parties, Halloween and festivals. This entry was posted in Fashion Accessories and tagged Contact Lens, contact lenses, Costume Contact Lens, Costume Contact Lenses, Costume Contacts, Crazy Contact Lenses, Crazy Contacts, Halloween contact lens, halloween contact lenses, Novelty Contact Lenses, Novelty Contacts, Party Contact Lens, Party Contact Lenses, White Contacts on January 8, 2011 by Piercing Guru. Halloween contact lenses are the perfect way to complete your costume but even on Halloween, it is important to keep contact lens safety in mind. Halloween contact lenses are perfectly safe but they must be used and stored correctly, otherwise they could lead to irritation. Taking care of your Halloween contact lenses is fairly easy – just follow some simple contact lens safety rules and you can eliminate any risk of eye irritation. Lots of people – myself included – will be wearing contact lenses to Halloween parties over the weekend so I am going to give you my contact lens safety guidelines. This post will tell you how to keep your eyes safe, care for your lenses and what to do with them when you get home from your Halloween party. This entry was posted in Contact Lenses and tagged Contact Lens, contact lenses, Crazy Contact Lenses, Halloween contact lens, halloween contact lenses, Novelty Contact Lenses, Scary Contact Lens, scary contact lenses on October 30, 2010 by Piercing Guru. 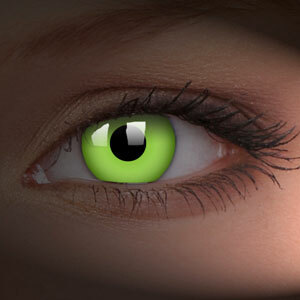 A pair of green contact lenses is a great way to update your look or complete your Halloween costume. There is a great choice of green contact lenses out there, from convincing natural-look green contacts to freaky Halloween designs and UV contact lenses. 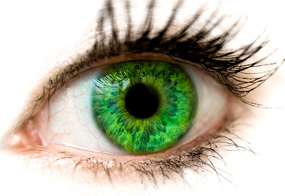 Green contact lenses suit most people because they open up the eye area and refresh the look of your eyes. This makes them very flattering, perfect for when youâ€™re the centre of attention. Personally I love green contact lenses. My eyes are green-grey and a pair of bright green contact lenses just makes them so much more intense. It really brightens up my whole face and I wear them for events like parties, costume parties and clubbing. 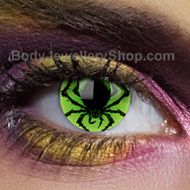 I havenâ€™t actually worn a pair of green Halloween contact lenses but I know they would look great. This entry was posted in Contact Lenses and tagged colour contact lenses, Coloured Contact Lens, Coloured Contact Lenses, Contact Lens, contact lenses, Novelty Contact Lenses on September 6, 2010 by Piercing Guru.